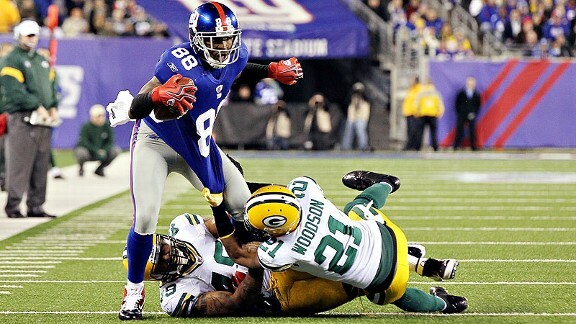 Star cornerback Charles Woodson is among those to express concern about the Packers’ defense. Fear is a strong word. I don’t think the Green Bay Packers fear the consequences of their historically porous pass defense. They won 15 games with it during the regular season, after all. I’m not even sure they’re worried about it. They discovered and have implemented the antidote throughout the past four months. But if you’re someone who likes to conceive the worst-case scenario, you don’t have to think too hard. The Packers tripped only once this season, despite giving up an NFL-record 4,796 passing yards, mostly because they intercepted a league-leading 31 passes. In the playoffs, of course, the quarterbacks are better and less prone to mistakes. The Packers could face a Pro Bowl quarterback at every step between now and Super Bowl XLVI. The bottom line: If an elite quarterback gashes them for yards but avoids the interceptions, he could knock the Packers out of the playoffs. To be sure, there have been all kinds of attempts to poke holes in the Packers’ near-perfect season. To me, this is the one instance with merit. The Packers’ only loss this season came when Kansas City Chiefs quarterback Kyle Orton threw for 299 yards with no interceptions — the only game this season the Packers didn’t create at least one turnover. First up this postseason will be the New York Giants’ Eli Manning, who fell 67 yards shy of a 5,000-yard season and threw for 347 yards and three touchdowns in a Week 13 loss to the Packers. The final score was 38-35, and the Packers’ scoring included linebacker Clay Matthews’ interception return for a touchdown. With the exception of a few pointed statements from cornerback Charles Woodson, the issue has mostly bubbled below the surface. But speaking late in the regular season, Woodson reiterated his concerns about the defense’s aptitude for postseason football. Charles Woodson: "We just give up way too many things on a consistent basis, so we have a long way to go. … Just not playing good football at times. We've been consistently inconsistent throughout the season." As the chart shows, the Packers allowed a 300-yard passer in nearly half their games this season. They intercepted the Carolina Panthers’ Cam Newton three times to spoil a 432-yard day, for example, and held off the San Diego Chargers mostly because they intercepted Philip Rivers a career-high three times and returned two for touchdowns. Manning, meanwhile, compiled eight 300-yard games during the regular season; the Giants were 4-4 in those games. He threw the seventh-most interceptions in the NFL, 16, but has thrown only one interception in the Giants’ past three games. What has been the issue? As the second chart shows, the Packers’ standard pass rush — four or less rushers — hasn’t been nearly as effective as it was last season. They have given up an NFL-high 8.5 yards per attempt on those plays and managed only 11 sacks. As a result, Capers has dramatically increased his blitz totals from last season. He elevated from a blitz on 32.8 percent of opponents’ drop-backs in 2010 to 45.7 percent in 2011, the fourth-most in the NFL, according to ESPN Stats & Information. The only NFL team that affected a bigger blitz uptick this season was the Houston Texans, who changed defensive coordinators in the offseason. I included the blitz percentages for each of the 300-yard games in the first chart; they blitzed 51.6 percent of the time on Orton’s 299-yard day. Given his druthers, I doubt Capers wants to blitz as much as he has. In his session with reporters, he pointed to the Packers’ Week 12 game against the Detroit Lions as “far more like [the way] we want to play.” In that 27-15 victory, the Packers blitzed a season-low 22.4 percent of the time and limited Lions quarterback Matthew Stafford to 276 yards. None of Stafford’s 32 completions went for longer than 23 yards.